That's right, I can't remember the last time I shampooed my hair! (that's actually a lie, I'll get to that in a minute). I've started doing something called the 'no poo method.' Look it up, it's a thing. My sister got me going on it - she has really curly hair and, as accompanies curly hair, has had a life long battle with frizz. She started doing the no poo method and for the first time in her life could tame her mane straight out of the shower! In the no poo method you use baking soda for your shampoo and apple cider vinegar as your conditioner. Baking soda cleans your hair but doesn't rob your scalp of all it's oils, like shampoo, so it doesn't overproduce oil that will make your hair greasy. I currently wash my hair 2-3 times a week. The no poo method not only leaves your scalp hydrated, it also leaves the shaft of your hair moisturized too! 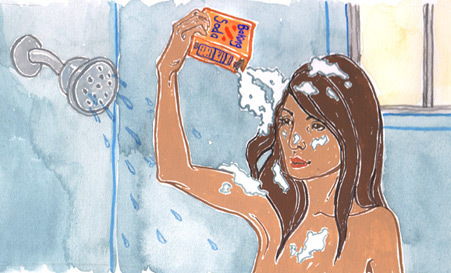 Shampoo is a detergent (anything that suds up it's drying - goes for your face too!) and it takes the moisture from all of your hair! When I started the no poo method I badly needed a hair cut, I went to show my friend how bad my split ends were, but there was nothing to see - the split ends were still there, but they weren't fraying out looking for moisture. After doing the no poo method only twice! The whole 'your hair has moisture' thing will also result in fewer fly-aways. This is what my curly haired sister enjoyed the most. Your hair frizzes out because it's looking for moisture in the air, but if it's not parched from shampoo then it won't flare out looking for water in the air. Shampoo leaves a film. It's made to. It's supposed to make your hair look more sleek, but in the long run it creates a build up on your hair that makes it look dirty quickly and makes it loose it's natural luster. You will have zero build up from the no poo method - actually resulting in better volume since your hair isn't weighed down. (FYI: make sure you wash it out well - I have occasionally not gotten out all the baking soda). Less breakage! For all the reason listed above - more moisture, less build up, ect - you will see your hair break off less frequently! So if you're going for long hair you won't see your length disappearing. Grows faster and hair regrowth! Your hair can get through your scalp with the ditched build up. I grab my baking soda and mix it up with equal parts water in a oil/vinegar vial. I then get in the shower and put it all over my scalp. I only wash my scalp - don't wash all of your hair, it really doesn't need it (another myth we've been taught, but really leaves our hair overly annoyed). I have to shake my mixture frequently to keep it consistent and often add more water to it in the shower. Rinse well. You will not be happy with yourself if you mix any baking soda and vinegar on your hair - you will have a 5th grad science project volcano reaction on your head, which will leave your hair feeling like straw! Apply the apple cider vinegar. I have mine mixed with equal parts water in a spray bottle. I put this all over my hair. ACV, among it's many uses, is a natural conditioner. It smells in the shower, but it won't have a linger scent after you wash it out. It will take about two weeks for your hair (and you) to acclimate to this method. You will find yourself missing the lather of your shampoo, the ultra slippery feeling of your conditioner and the aroma of each. You'll get used to the lack of lather and slippery feel, as for the scent you can add in some essential oils to your mixes. To ease the transition for your hair it helps to start with a cleansing shampoo to get rid of the current build up (the baking soda is trying to break through all the build up and you'll find yourself not as clean for a few times otherwise). You can either use a cheap shampoo like Suave or I like this natural option. When we got out to Minnesota I didn't bring all my stuff with me so I used shampoo a few times and just in that few times I noticed my hair get greasy faster, not be as manageable, I can see my split ends again (maybe that good cause it clued me in that I need a haircut!) and I have build up on my scalp! I got used to no poo that I kind of forgot how well it works! Oh, and one last thing: you can't do a coconut oil mask with this method...you'll look terrible! Since the no poo method doesn't have a detergent (shampoo) to rinse out all the oil it won't rinse out...umm, just don't do it. The good news is that you won't have the need to do a coconut mask! Here are two CREATE posts about the no poo method. Code Red Hat has done this method for a long time and has great insight into troubleshooting with this method and adds on some other natural things you can do with your hair. Weslie Christensen guest posted on The Skinny Confidential and she gives advice on going no poo while still using some of your products and talks about Wen (it's a detergent free cleanser, I so want to try it but it's pricey!). I'm going to have to try this! Good to know all this. I shampoo my hair way too often. You know me - I've always shampooed infrequently :). But it really is great to have to style your hair less and all of the health benefits for your hair make it totally worth it! Especially since you have thin hair, it'll give it more volume! Awesome! So cool to hear you tried it - it is kind of a jump (even just mentally) to stop shampooing, but I really like it. I also just found a honey cleaner that I'm curious in trying and maybe combining the two...I'll let you know :).